Avengers: Infinity War is the Lawrence of Arabia of superhero movies. It's a comic book Ben-Hur. In other words, this is a sprawling epic that runs a little on the longish side, yet uses the length to deliver genuine spectacle that also compels you on a character level. Although extremely unlikely to become the kind of cinematic classic those other two pictures are, it shares with them a dedication to scope. That makes Infinity War feel different – bigger – than the other entries in the Marvel Cinematic Universe thus far. The plot can be described in a single sentence: Thanos (Josh Brolin) is out to get all the Infinity Stones so that he can destroy the universe, and the Avengers attempt to stop him. The pleasure in the movie is the way it carries out that plot. There are, of course, a lot of superheroes. Almost every Marvel character to grace the screen before now is accounted for, with the notable exceptions of Hawkeye and Ant-Man. Infinity War takes a fun mix-and-match approach, teaming up the heroes in clever combinations. For instance, Thor (Chris Hemsworth) is rescued by Star-Lord (Chris Pratt) and crew. Since Thor: Ragnarok was as much a comedy as an action movie, putting the character with the inherently humorous gang from Guardians of the Galaxy allows for some funny interactions. Meanwhile, Doctor Strange (Benedict Cumberbatch) encounters Iron Man (Robert Downey, Jr.), who brings in Spider-Man (Tom Holland). Captain America (Chris Evans) and Black Widow (Scarlett Johansson) end up in Wakanda with Black Panther (Chadwick Boseman). You get the picture. Also present are Hulk (Mark Ruffalo), Vision (Paul Bettany), Falcon (Anthony Mackie), and Scarlet Witch (Elizabeth Olsen), as well as the supporting players from each individual Marvel chapter. The danger in trying to include so many characters is creating a tonal mess. Unlike Avengers: Age of Ultron, which had to take care of so much “business” that it occasionally lost track of itself, Infinity War successfully weaves everything together. The key is essentially dividing the movie up into just a few sections, each anchored by a single character. Scenes with Star-Lord feel like the Guardians movies with appearances from other heroes, sections set in Wakanda maintain the feel of Black Panther, and so on. This way, you aren't getting an eight-movie pile-up, but rather a three- or four-movie combination that is more carefully balanced out. The effect isn't 100% smooth; it's smooth enough, though. The action scenes are extremely well-done, with a battle on Wakanda being the standout. Directors Joe and Anthony Russo (Captain America: Civil War) establish some human stakes, build up to a major explosion of action, then repeat the process. Anyone who has absorbed the MCU has come to expect top-notch action, and the character development has similarly been a key part of the appeal. Infinity War dramatically raises the bar on the latter part of that equation. In the final half hour, and once before it, events occur that are breathtaking in the way they're willing to rewrite the rules of Marvel movies. This chapter is a game-changer in that respect, playing on the affection we've developed for all the characters and then thoroughly shaking it up. No playing it safe here – the screenplay by Christopher Markus and Stephen McFeely has twists that keep you hooked and make you gasp. Avengers: Infinity War is technically the first half of a two-part saga. It ends on a gut-punch cliffhanger, albeit not one that makes you feel ripped off. If anything, you'll be clamoring to find out what happens next, especially once you realize the implications of the now-requisite post-credits scene. What lies ahead offers great promise. The Marvel Cinematic Universe has been remarkably steady in quality so far. Infinity War maintains that quality, simultaneously letting us know that the Universe will never be the same again. 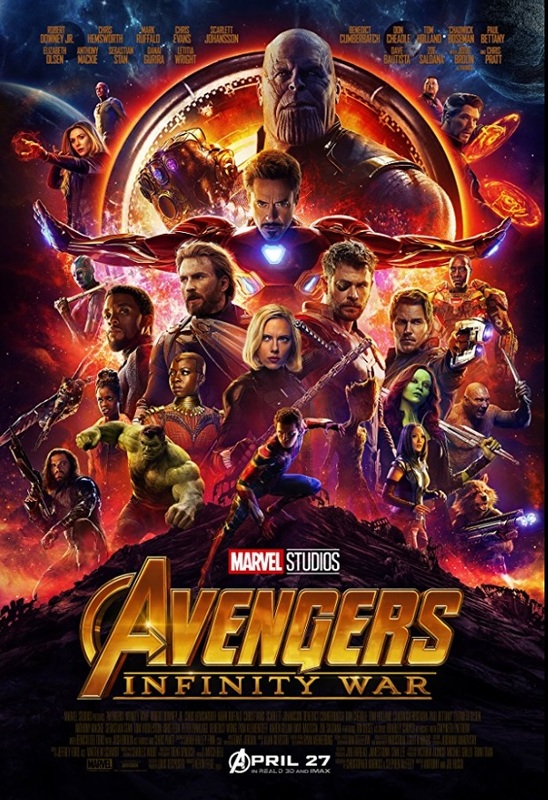 Avengers: Infinity War is rated PG-13 for intense sequences of sci-fi violence and action throughout, language and some crude references. The running time is 2 hours and 29 minutes.